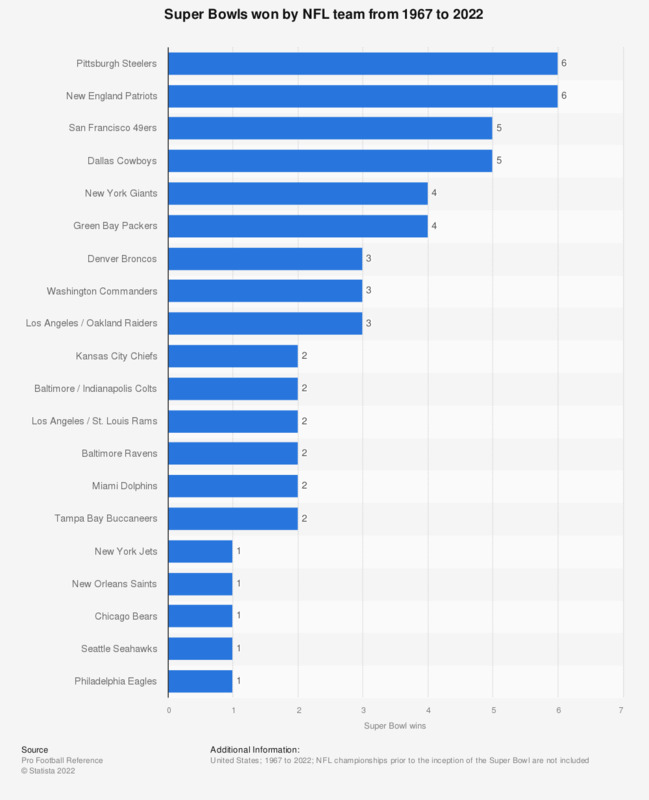 The statistics ranks the teams of the National Football League by the number of Super Bowl titles won from 1967 to 2019. The New England Patriots have won the Super Bowl six times, most recently Super Bowl LIII in February 2019. The Super Bowl is the annual championship game of the National Football League (NFL), pitting the champions of the NFL’s two conferences (AFC and NFC) against each other. The games were originally created as part of a merger agreement between the American Football League (AFL) and the National Football League, with the first Super Bowl being played on January 15, 1967, following the 1966 football season. To identify the games, successive Roman numerals are used leading up to the most recent Super Bowl in 2014 (Super Bowl XLVIII). With six championships wins each, the Pittsburgh Steelers and the New England Patriots are the most successful NFL franchises in terms of Super Bows won, as shown in the graph above. The New England Patriots are the most recent champions, defeating the Los Angeles Rams in Super Bowl LIII with a score of 13-3. Winning Super Bowl LII made Tom Brady the player with the most Super Bowl rings as players with a record setting sixth Super Bowl win. Charles Haley, who played from 1986 to 1999, has the second-most Super Bowl rings with five. Notable players who have won four Super Bowl rings are Joe Montana, Bill Romanowski, Adam Vinatieri, Ronnie Lott, Matt Millen and Terry Bradshaw. * NFL championships prior to the inception of the Super Bowl are not included.